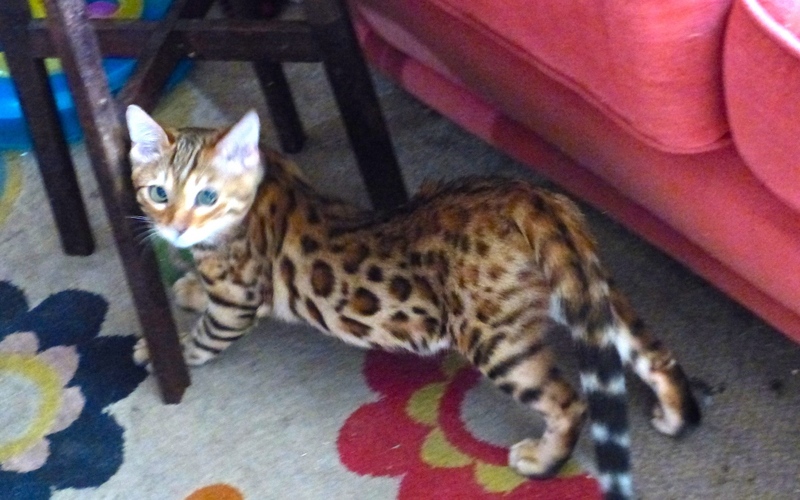 If you want to know exactly how important you are then get yourself a Bengal Kitten. Not the full tiger type of Bengal of course, but a cantankerous, demanding ninja kitten. Why Ninja? Because this little bundle of fur and ferocity has the ability to disappear in front of your eyes. You then spend hours hunting for the poor lost kitten, only to discover her sleeping behind a table, in a book case or on the mantelpiece behind an ornament. Amazingly they have the ability to pick places where you would never think of looking. Once you have found her. OK once she has woken up and announced her presence, you then start phase two of your training. This involves you preparing food for her. Chicken, tasty fish, raw meat, tinned cat food, and even special treats can all be bought and prepared at great expense. Do not worry because none of it will be eaten! Instead you will be subjected to nerve shattering calls for help as she clearly starves in front of your eyes. After just five minutes of this you buckle and move towards her to comfort the poor wee mite. FOOL! That is when you discover the sharpest claws in Christendom. As you leap back clutching the blood drenched hands the kitten disappears once again, safe for a moment from the evil doer that she thinks you are. Once again you are subjected to the piteous mewlings of this poor little kitten. Your partner stares at you as if you are related to the axe murderers of downtown Dallas or perhaps the Cat stranglers of Mongolia. It is clear that you deserve the wounds the cat has inflicted on you.